Existing theories of the nature of the state in Western capitalist democracies have been mostly propounded from one of three major theoretical perspectives, each emphasising a particular aspect of the state: the 'pluralist', which emphasises its democratic aspect: the 'managerial', which emphasises its bureaucratic elements: and the 'class', which focuses on its capitalistic aspect. Each of these theoretical perspectives has contributed something to our understanding of the state, but each also has its limitations. 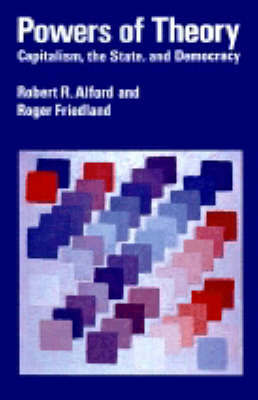 In this book, Alford and Friedland evaluate the strengths and weaknesses of each perspective and present a new, synthetic framework for a more comprehensive theory of the state. Impartially reviewing the major historical and empirical works within each theoretical tradition, they reveal how empirical study has been shaped by theoretical assumptions. They agree that each perspective has a distinctive 'power' to understand part of the reality of the modern state, although it is powerless to explain other parts. In each case, the part that can be explained is the perspective's 'home domain', or the aspect of the state that it emphasises, while other aspects are either rejected or reinterpreted. The authors argue that the state cannot be adequately understood unless full account is taken of each of these home domains, and they suggest how the contributions of each perspective to the explanation of its own domain can be integrated into a new, and more powerful, theory.